The story of Beren and Lúthien was especially close to Tolkien’s heart as the character of Lúthien, also known as Tinúviel, was based on his love for his wife. In fact an instance in their real lives where she danced for him is reproduced in the story as the point where Beren first sees Lúthien and falls in love with her. If you visit Tolkien’s grave in Oxford you will see Beren and Lúthien’s names chiselled into the stone next to Tolkien and his wife, Edith. 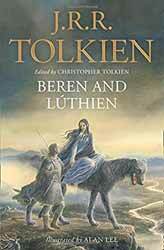 Beren and Lúthien: edited by Christopher Tolkien (2017. 288 pages) sees Christopher trying to present a continuous narrative of the story from J R. R. Tolkien's original unpublished drafts and notes. The story was one which Tolkien returned to again and again and a version appears in The Silmarillion as well as in The Lord of the Rings, as a tale told by Aragorn. In its most complete version it is a tale of an elven princess who falls in love with a mortal man and gives up her immortality for love, a story which directly mirrors Aragon and Arwen Evenstar’s tale. In the wider history of Middle-Earth their story has an added importance as their descendants would become the kings of Númenor, who fell from power to become the Dúnedain, Aragon's people. They would also sire the line of Elrond, Arewn’s people. Tolkien worked on the tale for most of his life and tried to produce it in differing formats, both as prose and as a long form poem. Because of this many changes were made. Originally Beren was not a mortal man but another elf, who is often referred to as a gnome. For some reason he initially thought that his readers would all leap to the old Greek version of the word which translates as thoughtful or wise, rather than the more modern interpretation of a wizened old man, more akin to a troll. In later versions he dropped this nomenclature. Out too were references to elves being fey or fairies. As the tale evolved the changes continued leaving a story which could seem, at times, to be unreadable. Christopher Tolkien has set out to try and bring all of these changes together to create a single whole. The book provides extensive notes from the editor to point out changes of names and relationships in order to make the thing as coherent as it can be. I originally bought the hardback version of the book when it first came out and was pleasantly surprised that the wonderful illustrations by Alan Lee have been reproduced as glossy plates in this paperback version. There is a slight down side to the book and it’s the inconsistent style of writing which ranges from faux Shakespearian to the more familiar, but no less difficult, style of The Silmarillion. Likewise as the tale is ever evolving the book sits in a grey area between academic interest and Tolkien completest. It may struggle to find a wider audience.